Mathcad handles text as easily as it does equations, so you can make notes about the calculations you are doing. To begin typing text, click in an empty space and do any one of the following: choose Text Region from the Insert menu, press the doublequote key (“), or click on the text region button on the toolbar. • Click in the blank space to the right of the equations you entered. You’ll see a small crosshair. • Press” to tell Mathcad that you’re about to enter some text. Mathcad changes the crosshair into a vertical line called the insertion point. Characters you type appear behind this line. A box surrounds the insertion point, indicating you are now in a text region. This box is called a text box. It will grow as you enter text. 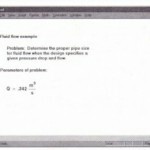 • Type Equations of motion Mathcad shows the text in the worksheet, next to the equations (Figure 1-4). • Then type for falling body under gravity. • Click in a different spot in the worksheet or press [Shift][..1]to move out of the text region. The text box will disappear once you have done this. Don’t use the [..1] key. If you press [..1], Mathcad will insert a line break in the text instead of leaving the text region. Figure 1-5 shows the worksheet with two lines of text and the cursor outside the text region. Since you are outside the text region, the cursor appears as a small cross, and the text box is no longer visible.